Mawlamyine is the third largest city in Myanmar after Yangon and Mandalay situated 165 kilometers east of the nation’s capital across the Gulf of Mottama at the mouth of the Thanlwin river. It is the capital of Mon State with a population of almost 300,000 people. Formerly known as Moulmein, it was once a thriving teak port and the administrative capital of British Lower Burma. The town’s signature landmark is Kyaikthanlan pagoda built in 875 AD and thought to be the site from where Rudyard Kipling wrote his famous poem, ‘The Road to Mandalay’. It’s unlikely that Kipling was referring to Mandalay Ward located at the base of Kyaikthanlan pagoda, but rather the ‘Mandalay’ in central Myanmar. The Thanlwin bridge, the longest road and rail bridge in Myanmar is the most prominent landmark in the area. It stretches a distance of 11,000 feet over the Thanlwin river connecting the country’s south eastern region with its capital, Yangon. Mawlamyine is generally considered to be off the main tourist trail for most travellers to Myanmar but the town does have a charm of its own with its rich history, buildings with colonial style architecture, World War II era wooden buses, and its close proximity to the infamous Siam-Burma “death railway”, making it a fascinating place to visit ! 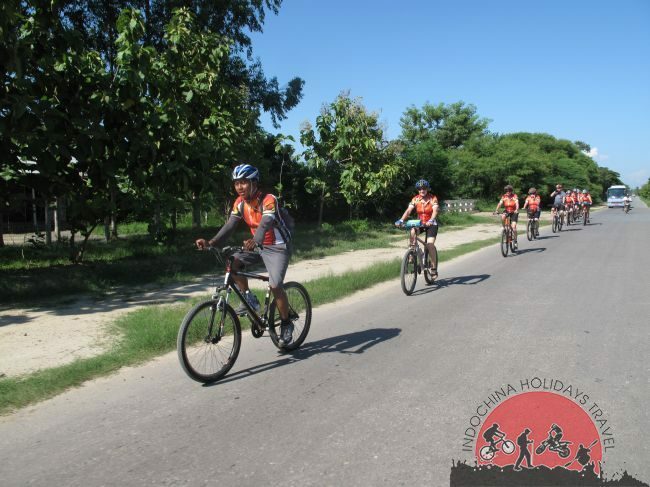 Myanmar Cycling tours guide and driver will pick you up at your hotel at 7:30 .Mawlamying, known as Molmein in the British times, is the 3rd largest city in Myanmar and situated in the south of Myanmar. It is about 6 to 7 hours to go by car. To arrange the cycling tour(with Mountain Bikes!!! ), On the way to Mawlamyine bike about 60km. Evening arrive at Mawlamyine. Overnight at Mawlamying. Today cycling tour will take you to the most beautiful(but few people know it, indeed!!!) Monastery Complex built and donated by the Colonial-Era Burmese Merchant, called U Na Oak. To reach the village, you will have to cross by the bridge over two rivers called Gyaing and Attran rivers. It is their rule effective so far today that you can’t cross the bridges by bicycle and therefore, you need to load the bikes on the accompanying Sag Wagon. Then unload after crossing the bridge for continuing the cycling tour. You may visit Pomelo Orchards on the way to Kado Village where you will see the best Glass Mosaic decorations and Teak Wooden Buddha Images. The monastery is donated by a Myanmar Well-Known Teak Merchant, U Na Oak. We used to learn about his patriotic battle in terms of inland water transport business against the then Irrawaddy Floatilla Company in the British times. Walk around the monastery complex, take the pictures of the amazing wood-carvings decorated on the inner walls of the monastic buildings. Sometimes, you will see the European pillar pedestals at some of the buildings. Then, you will be transfer to the jetty where you will have a One-Hour Boat cruising along the Attran River up to the city of Mawlamying. Overnight in Mawlamyine. Cycling to Pha-an, the capital city of Kayin State, one of the ethnic majority, is worth a lot. Surrounding the city are the Natural Lime-stone Caves, Hot Springs, Pagodas & Temples, the Thanlwin(Salween River) with Natural beauty with Clear Water for a pleasant boat trip, and many more. Cycling excursion for today, we will make along the motorway but not very busy with trucks and car. All the way, you can enjoy the beauty and nature of the countryside. On the cycling route, you may drop in at the Kyauk Ka Lat Monastery which is surrounded by the water of the natural lake and the name of the monastery derives the Lime-stone column that is jetting out into the sky. 20 minutes Cycling from that monastery will take you to Kant Kaw Ta Htaung, one-thousand Buddhas sitting under the Kant Kaw Trees. That Buddha Complex is located just at the foot of Mt. Zwekabin, the symbol of Kayin State. Overnight in Pha-an. After breakfast, cycling from Pha-an to Bago, the ancient capital of Myanmar. Then drive direct to Yangon. Evening arrive at Yangon. Dropped you at your hotel. ***If above hotels are not available at the time of booking, we will use another hotel with same standard. All the touring itineraries on this website have been carefully crafted by our in-country management teams and represent a series of experiences we can certainly recommend. However, we understand that every travel experience should be as unique and individual as each traveler. Our consultants are waiting to hear from you so that we can tailor or custom design a Myanmar cycling tours to your individual specifications.